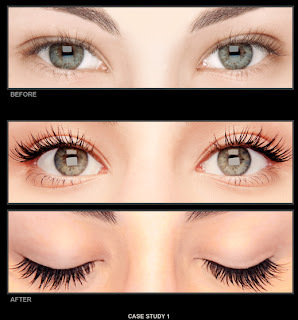 An in-salon treatment (around 45 minutes) that imparts on upper AND lower lashes --- a semi-permanent coating that makes lashes look mascara-ed (not the insane immensely long volume kind ---but the regular kind that looks realistic). About $150-$250 a session, the treatment give peepers the proper amount of black coating, 24/7 for about 60-100 days… it does not wash off. Note: a few caveats like no oil based makeup removers, no rubbing, don’t use an eyelash curler…and a mandate to keep the newly treated lashes from being exposed to hot water for 24 hrs…stuff like that. Not a big deal, we thought. At an annual cost of about $900 (and up) a year-the gals on our triathlon team, all with light blonde lashes- thought it “worth it” to have sculpted, camera ready eyes-right out of the swimming pool, in the AM when rushing to work etc…as in some cases, that and lip gloss are the only makeup they even wear. IMHO: A handy option---to make-up weary travelers…on holiday where who wants to bother. We tried a treatment at the same time as a magazine Beauty Editor -she in for a touch-up (she took a nap, btw). Interesting results- as the lashes are all evenly coated-in a way where the results---really, we could never wield a mascara wand to get this: eye openers for sure. Took two years in development to come up with the formulation-that is ok for very sensitive eyes and Latisse enhanced lashes too.